Have you ever been to a work event and received a goody bag? I did. And it was a bound proof of this book. All 800 odd pages of it. It appears I have a thing for VERY BIG BOOKS. Perhaps not the best tactic when you're trying to read a book a week. But I can tell you this was a hell of a lot easier than Wolf Hall. Justin Cronin is an American author and The Passage is his third novel. It's a sprawling, epic chronicle of the end of the world as we know it, and the rebirth of something far more dark and terrifying. The Passage follows the seemingly impoverished and anonymous life of Amy, a nine year old girl. But Amy is special. She holds the future of humanity inside her. When her mom abandons her at a convent, only Sister Lacey Antoinette Kudoto realises how special she is. But everything takes a surreal turn when she takes Amy to the zoo where two special agents come looking for her. Throw in a dozen psychotic death rows prisoners; a secret military installation in Colorado; some genetic engineering to end them all; and you've essentially got the basic ingredients for a crazy, epic, horror murder mystery. There's a lot to recommend this book. Ridley Scott has already bought the film rights. So it can't be bad, can it? Well, no, it's not bad. It is in fact gripping, disturbing and unsettling. It gave me nightmares. I couldn't stop thinking about it during the day. And yet, it was overlong, would have benefited from tighter editing, and felt as though it had been intended as a television series. There are plenty of sub-plots, characters and situations that were introduced, but never really explored. 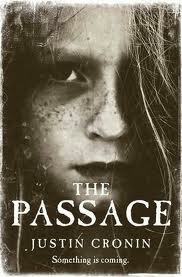 The Passage will spook you out. It's worth persevering with it. And you'll wonder if there are plans for more.